All students taking physical education are required to pay a $3.00 activity fee and provide a lock for their physical education locker. 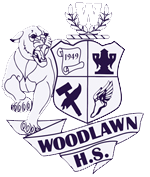 Students are also required to purchase and wear a Woodlawn High PE uniform ($25.00). Description: This one semester course is required to graduate. The course is comprehensive. Course contents include nutrition; safety and first aid; mental, emotional and social health; consumer health; substance abuse; communicable and non-communicable diseases. Description: One semester of team sports for 9th grade boys and girls which is required to graduate. This one semester physical education course is paired with Health. Description: Physical Education II is designed for 10th grade boys and girls. This is a full year course which is required by the State Department of Education. After successfully completing this course and Physical Education I, a student will have completed the state’s physical education requirement. The activities are the same as Physical Education I but students are expected to perform at a higher level and with greater proficiency. Description: PE III is open to juniors who have completed the state physical education requirement and will count as an elective credit towards graduation. Description: PE IV is open to seniors who have completed the state physical education requirement and will count as an elective credit towards graduation.